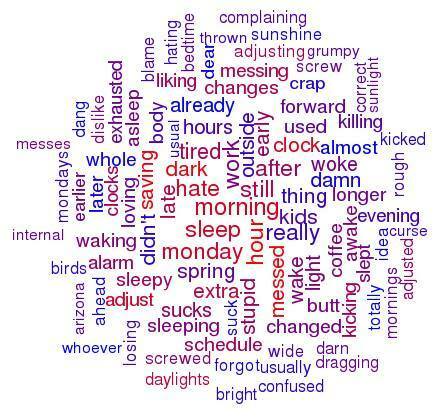 How Did Facebook Users Respond To ‘Springing Ahead’ For Daylight Saving Time? 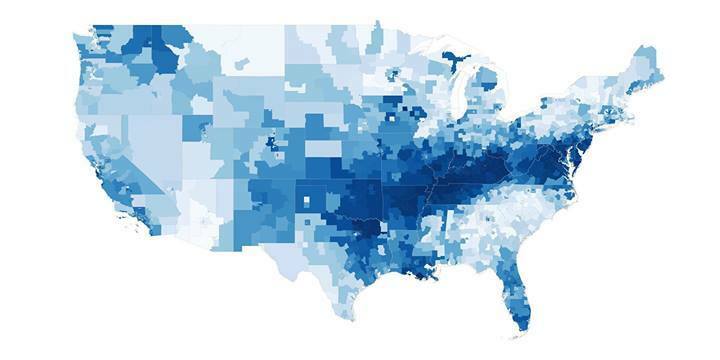 What effect does daylight saving time have on Facebook users? According to a study of anonymized, aggregated user data from the social network by Mike Develin, Lada Adamic, and Bogdan State of the Facebook Data Science Team, from 5 a.m. to noon on the Monday after daylight saving time takes effect, inclusion of “feeling tired” in status updates is up 86 percent when compared with a typical Monday. However, the researchers also uncovered some positives about the Monday after daylight saving time, saying that usage of wonderful is up 21 percent, great up 19 percent, and happy up 5.7 percent, while usage of annoyed is down 14 percent, bored down 12 percent, and sad down 4.8 percent. 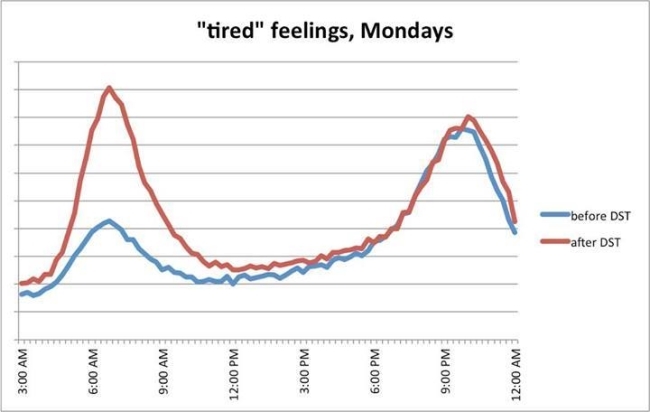 Overall on that Monday, usage of tired is up 25 percent, while sleepy is up 28 percent, and exhausted is up 20 percent. The Facebook Data Science Team also found that usage of tired, sleepy, and exhausted taper off during the week, to the point where tired is only up 0.1 percent on the Thursday after daylight saving time compared with the average Thursday. Meanwhile, the “extra hour” of daylight at the end of the day maintains its positive effect throughout the week, as the Thursday after daylight saving time still sees happy up 3.5 percent, wonderful up 4.8 percent, and great up 4.2 percent. This map shows the effect in every geographical area (regions of the map have similar population), with a darker blue indicating a larger increase in “feeling tired” over the previous Monday morning. In addition to the Arizona sanity check (Arizona does not change its clocks), we see interesting geographic patterns: The effect is most pronounced in a band in the middle of the country, the Northeast corridor, and Florida. In more southern states — where there is more sun during the winter, and reality is thereby less bleak — we see both a smaller difference to start with and a smaller effect for DST. However, we still see the same pattern upon returning to work: On Monday, people in Southern states with DST are less happy in the beginning of the day than their unchanged counterparts, and in the evening they are happier. Finally, what are people talking about in status updates mentioning the time change directly? 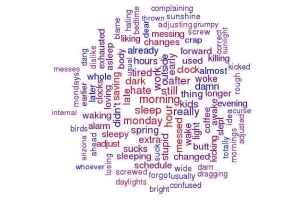 Here are the words that appear most often in posts on Monday that use “time change” or “daylight savings.” Opinions on the time change itself seem to most often take the form of complaints, but as we’ve seen, there is happy news at the end of the tunnel. Readers: What did you think of the findings by the Facebook Data Science Team?